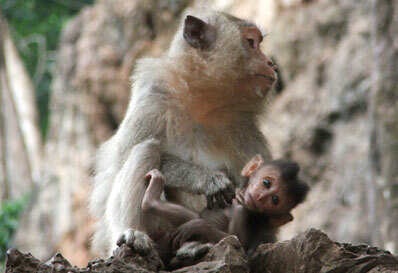 The mammal one is most likely to observe in the mangroves along Thailand’s coast is the versatile Long-tailed macaque. Also known as the Crab-eating macaque, This species is ideally suited to the demanding habitat conditions imposed by mangroves. The Long-tailed macaque is an excellent swimmer (unlike gibbons and langurs which abhor water) and is able to cross mangroves channels in search of new foraging sites. This primate spend a good deal of its time on the ground and it seen mudflats where it feeds on crabs, encrusting oyster, mudskipper, seeds, fruits, seedlings and fallen leaves. While the macaque can negotiate the seemingly impossible tangle of mangrove roots, when it wants to flee rapidly it usually does so in the mangrove flee canopy. The Long-tailed macaque’s traditional predator in the mangrove swamps, the huge Estusrine crocodile, now appears to be extinct in Thailand’s Andaman coastal water. There is always the possibility, however remote, that this large reptile could re-establishitself here from other areas, but for now, the Long-tailed macaque enjoys predator free waterway. Like mostly primates, the macaque are gregarious by nature and spend many hours during the high tide periods resting the trees and reinforcing their group bond by socially grooming one another, playing with their young and cuddling. The dominant male in each troop is easily distinguished by his large size and aggressive behavior if he feels his family is threatened in any way.